PATH and Mologic have announced a new agreement to work together to advance a rapid diagnostic test to support treatment and elimination of Plasmodium vivax. More than 2.5 billion people worldwide are at risk of infection with P. vivax malaria, mainly in Southeast Asia and Latin America. P. vivax is especially difficult to eliminate because the parasite can lie dormant in the liver and re-emerge, causing periods of relapsing illness. With each relapse, patients become progressively sicker, and can continue to spread the disease through mosquitoes to other members of the community. Treatment with 8-aminoquinolines, a class of drugs that includes primaquine, is currently the only means to kill the liver form of the P. vivax parasite and prevent the cycle of relapse and transmission. However, 8-aminoquinolines can cause serious side effects in patients with severe glucose-6-phosphate dehydrogenase (G6PD) deficiency, a hereditary condition common to areas where malaria is found. Therefore, the World Health Organization recommends testing patients for the condition before administering treatment with primaquine. Critically, diagnostic tests currently on the market for G6PD deficiency are neither simple enough to support their widespread use in low-resource areas nor robust enough to be used in the hot, humid areas where malaria is endemic. 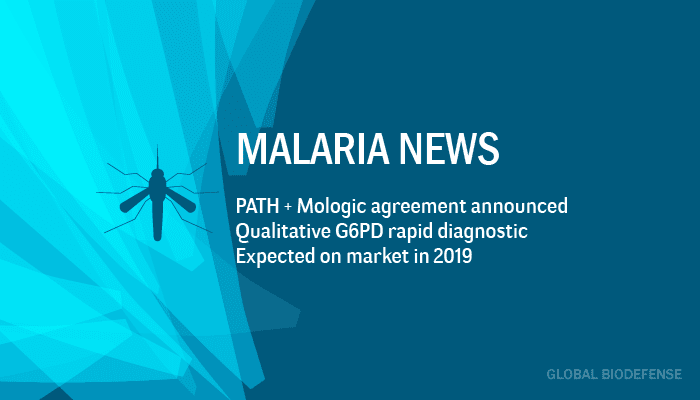 PATH is advancing a portfolio of tests for G6PD deficiency that meet requirements for use in settings where P. vivaxmalaria is close to elimination. As part of this effort, PATH is working with Mologic to develop a novel qualitative point-of-care G6PD rapid diagnostic test (RDT). This new RDT has the potential to improve access to G6PD testing to support appropriate administration of primaquine. PATH and Mologic optimized the Mologic RDT for use in environmental conditions typical in malaria-endemic countries, resulting in a test that is designed for use including at the community level, where malaria is commonly diagnosed and treated. It provides simple results (i.e., positive or negative) that can be easily interpreted by test users to determine if a patient has severe G6PD deficiency and is therefore at increased risk for side effects if treated with primaquine. This qualitative G6PD RDT can provide a simple and affordable alternative to quantitative tests, which provide a numerical readout of G6PD levels but may be more expensive. “This test will be a significant addition to the G6PD testing options available to health care providers to inform case management of patients with P. vivax malaria. It will help to fill critical gaps in G6PD testing experienced by elimination programs, and will complement quantitative tests for G6PD deficiency being advanced by PATH and partners.” – Dr. Gonzalo Domingo, scientific director and malaria diagnostics lead at PATH. The first product variant is expected to come to market in 2019. PATH is supporting Mologic to commercialize the RDT and obtain key regulatory approvals. Funding to PATH to support advancement of new G6PD diagnostic tools has been provided by UKAid from the United Kingdom Department for International Development and the Bill & Melinda Gates Foundation.